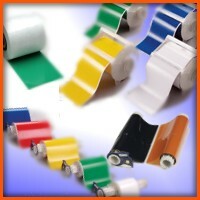 Most people refer to PowerMark labeling material as "PowerMark Vinyl", but it is also known as PowerMark tape. PowerMark tape is designed to be used in the PowerMark sign and label printer, and comes in a pre-loaded cartridge. To make sure that the tape cartridge is used in the right printer, Brady incorporates special supply locking hardware in the PowerMark printer. A chip is also inside the PowerMark tape supply cartridges, which allows the printer to operate only when loaded with a Brady or compatible cartridge. These are some of the many catalog numbers for commonly used Brady PowerMark vinyl tapes. These are just examples of the many supplies that are available for the Brady PowerMark label printer. Get 3x the tape on a single roll, available in more than 70 colors!